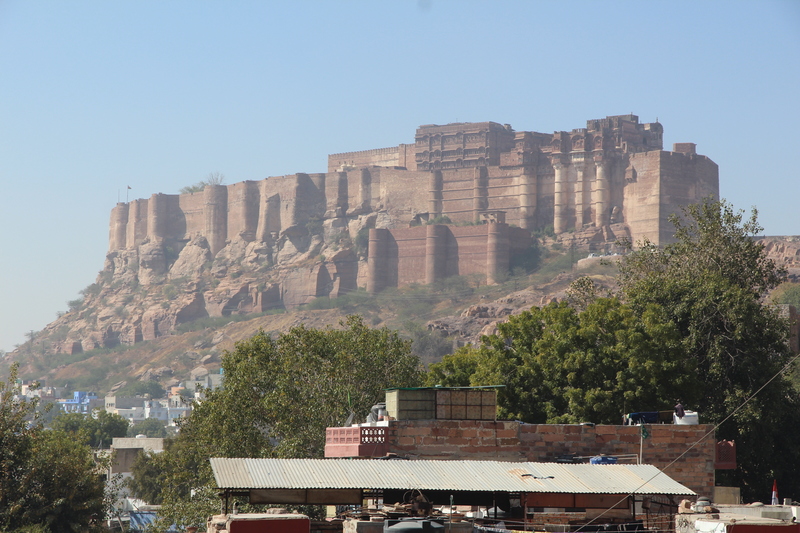 Mehrangarh Fort—a massive jewel of Jodhpur | Where to next? It’s so massive that Rudyard Kipling called it the ‘work of giants’ and it’s easy to see why. Mehrangarh Fort in India’s Rajasthan spreads more than 81,000 square metres across a 400-foot perpendicular cliff that overlooks the city of Jodhpur. 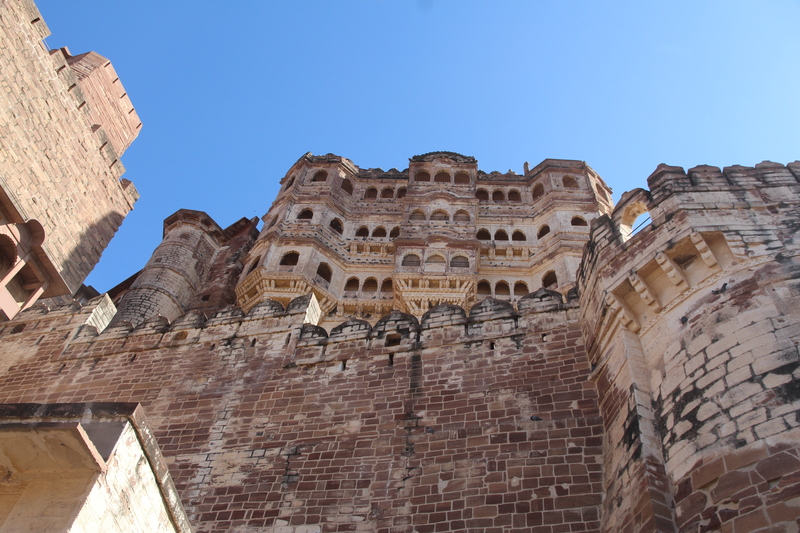 The dimensions are so huge that even though it is officially called a fort, Mehrangarh is sometimes described as the second largest castle in the world. It has seven entry gates and walls that are 36 metres high and 21 metres wide. I was gobsmacked to look up at it as we approached and even more overwhelmed to actually go through it. We spent a whole afternoon and could easily have spent a whole day. 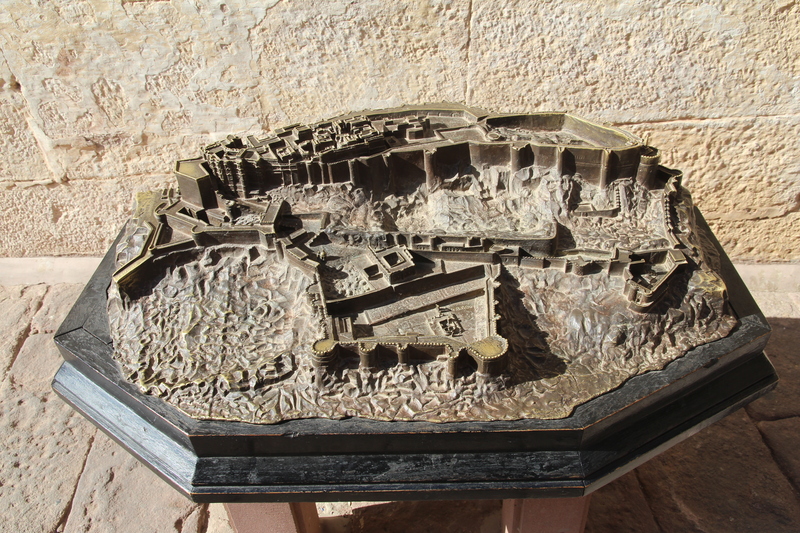 Mehrangarh was started in 1459 when the city’s founder, Rao Jodha, moved his capital from Mandore to Jodhpur, but most of today’s fort dates from the 17th century. Most of the fort’s seven gates were built to mark victories in various battles. 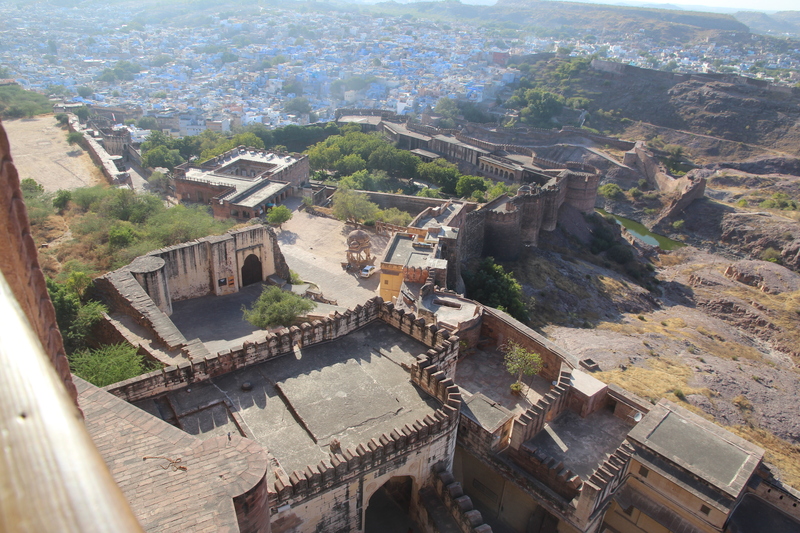 To commemorate this victory, Jodhpur’s Maharaja Man Singh Ji built the first entrance jaipol (victory gate) and added a new fort wall in front of the cannonball scarred one. Another gateway has handprints from ranis (queens) who burned themselves to death on the funeral pyre of their husband, Maharajah Man Singh. Yep, one guy with many wives. 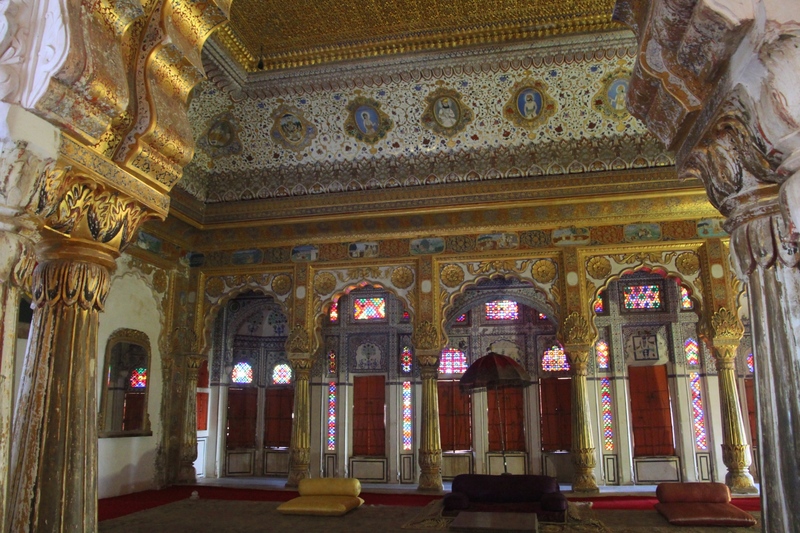 There are several beautifully crafted and decorated palaces, including Moti Mahal (the Pearl Palace), Phool Mahal (the Flower Palace), Sheesha Mahal (the Mirror Palace), Sileh Khana and Daulat Khana (a gallery of fine and applied arts). These are true showpieces featuring mirrors, intricate paintings, stained glass, portraits, furniture and more. 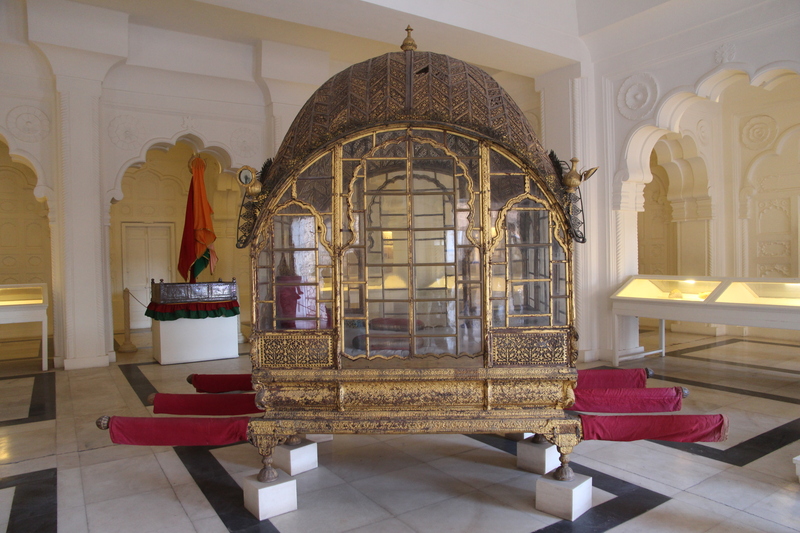 The museum rooms of the fort have collections of palanquins (for carrying noble women and occasionally noble men), howdahs (seats for riding elephants), royal cradles, miniatures, musical instruments, costumes and furniture. 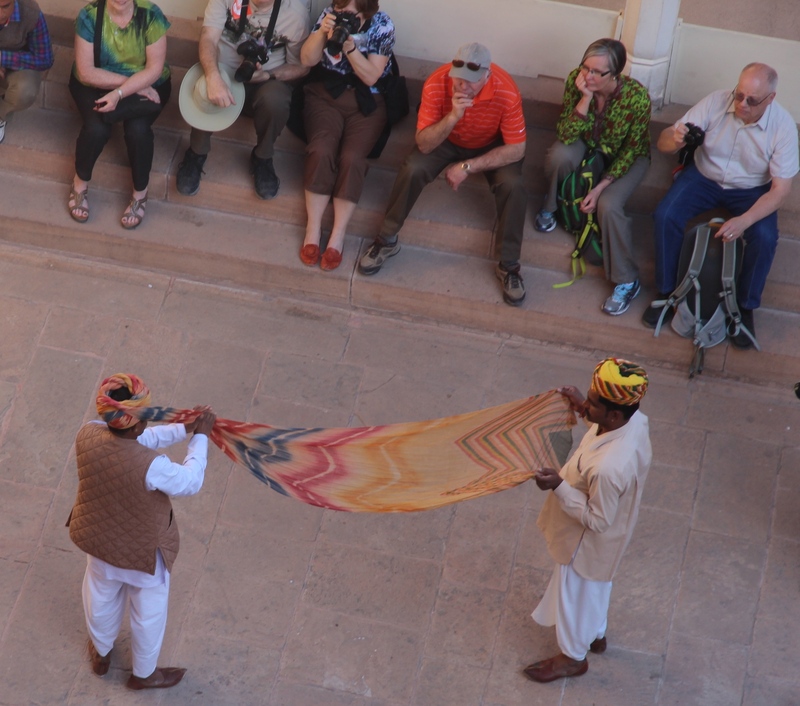 There’s even a turban gallery, which we managed to miss, but we did see a demonstration of a turban being wound onto a fellow’s head. 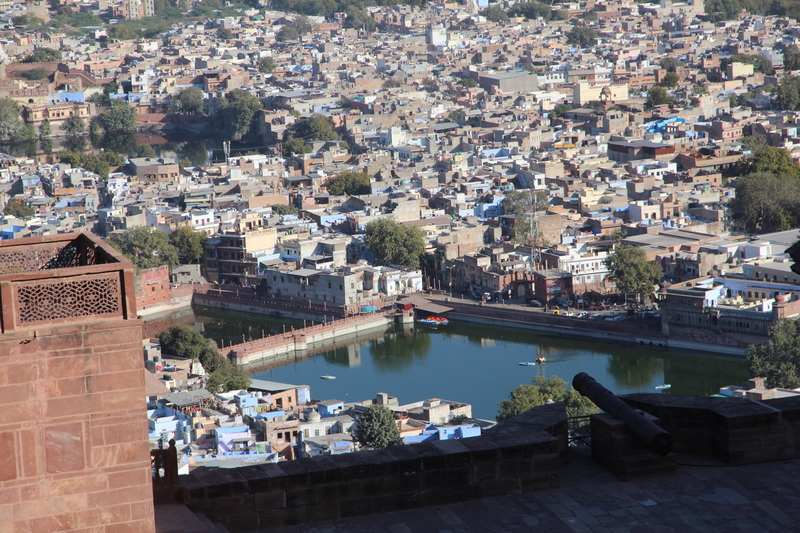 The fort’s ramparts provide an amazing view of the city and interesting overviews of the fort itself. There’s also Kilkala, a preserved old cannon. Now, I want to visit India! Thanks! Will check them out. For one who has never travelled,you are providing me with wonderful stories and amazing pictures of places I never expected to see. Through your eyes, I am sharing that journey. Grateful Thanks. Carol. Oh Carol, it is wonderful to have to you come along for the ‘ride’. Agree great pictures. Necessary to show what it is really like. Bollywood films are so much fun. All colour, music, jewels, movement. A real feast for the eyes and ears. Forts are fun too. What a fantastic place, amazing architecture and obviously built very strongly to have survived this long. Lets hope Isis never gets there and blows it up. It’s an amazing fort. I hope it can protect itself. Thanks for dropping by. I used that first pic on purpose because I thought it gave some sense of size. And sati is a horrible practice. Shocking. That is almost beyond comprehension. Let’s hope it can be preserved for a thousand years. It doesn’t look like it’s going to fall down anytime soon. Stunning – your pictures are amazing, it sounds like a fascinating as well as beautiful place. Thanks Joy, it’s a beautiful but little-known monument so I’m pleased to give it some ‘air’ time. What can I say? It’s magnificent! You’ve done well to show the size. It can be difficult sometimes to capture the scale of a building. What amazing places you’ve been too. Thanks Jane, I really wanted to convey just how huge this place is, so I really appreciate knowing the message ‘got through’. 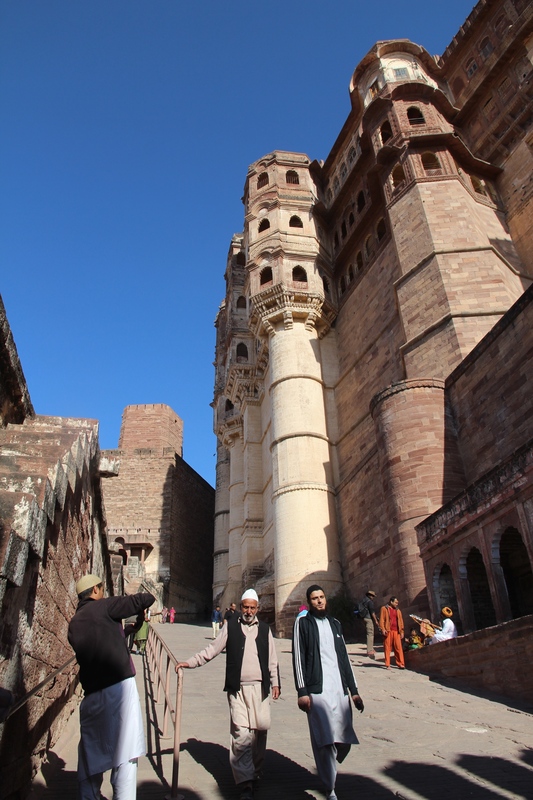 I love to travel vicariously with you and Poor John… just turn on my computer, then go to your Blog and here I am in India and at Mehrangarh Fort. No travel costs, view when I want to, read about places I have never seen or heard about…. Again, good photos and areas within the Fort. Sy, you are always a good travelling companion. And it’s not often that I go places you haven’t been to before. Thanks. I so echo everything everyone has said above – stunning pictures – enjoyed every single one – you did not overdo it. Like you I could return to India in a heartbeat. Might have to think of something for 2016. Thanks so much. Glad you stopped by. Thank you. I’m glad you enjoyed seeing it. I hope you get there. It’s a fascinating country. Hi ! Loved these ! Was of great help when doing a project on it. I was wondering if you had more pictures, especially of the model, could you share them personally ? I am working on the documentation of the Fort. Do contact me if you would like to help, I’d appreciate it a lot !! Hi Sahla, thanks so much for stopping by and commenting. I’m delighted to know this was useful for you. I’m sure I have more pics of the Fort (maybe not the model), but they are on a different computer. I am away from home for a few days and will send pics after I return. That’d be brilliant ! I’ll be waiting ! Umaid Bhawan Palace—Jodphur’s other jewel | Where to next?